The World Intellectual Property Organization annual General Assembly opened today with an unusual number of issues for delegates to solve, in particular those inherited from the committee in charge of approving the budget and the programmes of the organisation earlier in the month. Among pressing issues are WIPO external offices and decisions to be made on potential treaties such as on industrial designs, the protection of broadcasting organisations, and the protection of genetic resources and traditional knowledge. The 51th session of the assemblies of the member states of WIPO is taking place from 23 September to 2 October. WIPO Director General Francis Gurry published this morning the Report of the Director General to the WIPO Assemblies 2013, in which he outlined achievements by the organisation. In his opening remarks, Gurry said the organisation was financially sound, and that several of the treaties operated by WIPO were showing “growth levels that out-perform the world economy,” such as the Patent Cooperation Treaty and the Madrid System for the International Registration of Marks. According to the DG’s report, two countries joined the PCT since the last Assembly (Saudi Arabia and Iran) and the Madrid System attracted four new members in the last 12 months (Mexico, India, Rwanda, and Tunisia). Expressions of interests in the Hague System for the International Registration of Industrial Designs have been received by China, Japan, South Korea, Russia, United States, and the member countries of the Association of South-East Asian Nations (ASEAN). PCT applications increased by 6.6 percent in 2012, said the report. The international applications for the Madrid System increased by 4.1 percent in 2012, and Hague System applications increased by 3.5 percent. “The highlight of the year, however,” Gurry said in his opening statement, was the successful conclusion of a new multilateral treaty, the Marrakesh Treaty to Facilitate Access to Published Works for Persons who are Blind, Visually Impaired or Otherwise Print Disabled.” All delegations at Marrakesh expressed hope that the constructive cooperation that led to success would be repeated in future normative agenda of WIPO, he said. Gurry mentioned two candidate treaties. The first is a proposed design law treaty, about which he said, “work is nearing completion” and for which the government of Russia as offered to host a diplomatic conference. The other one is the delicate issue of the protection of traditional knowledge, traditional cultural expressions and genetic resources. “It is of the utmost importance to bring this work to a satisfactory conclusion,” Gurry said. This has been a prickly issue, as a majority of developing countries would like to have a binding legal instrument and a number of developed countries have resisted the idea of a binding instrument. “It is clear that the tendency for intellectual property to move from the periphery to the centre of the economy continues,” Gurry said in the prepared remarks, illustrating this move with the “ubiquity of the internet” and the “huge economic value that is generated by the creative industries.” He indicated that WIPO studies across 40 countries indicate that, on average, the creative industries account for some 5 percent of GDP and some 5 percent of total employment. Outgoing Assembly Chair Uglješa Zvekić of Serbia presided over the election of his successor Päivi Kairamo, Permanent Representative of Finland to the United Nations in Geneva. Two vice-chairs were also elected: Mikhail Khvostov, Ambassador of Belarus, and Mokhtar Warida from Egypt. A new chair of the Coordination Committee was also elected: Fodé Seck, Permanent Representative of the Republic of Senegal to the United Nations in Geneva, with two vice-chairs: Virag Halgand, from Hungary and Alexandra Grazioli from Switzerland. A number of issues already discussed without consensus at the last session of the Programme and Budget Committee (PBC) – held from 9-13 September – were highlighted by group coordinators (IPW, WIPO, 16 September 2013). A number of developing countries said that the work of the Intergovernmental Committee on Intellectual Property and Genetic Resources, Traditional Knowledge and Folklore (IGC) is critical. Trinidad and Tobago on behalf of the Latin American and Caribbean Group (GRULAC) asked that a diplomatic conference be held in the next biennium and that a ministerial meeting be held before the next meeting of the committee. The African Group concurred and said it was concerned about the lack of political will on the part “of some of our partners to move forward” in the work of the IGC. The mandate of the IGC is up for renewal by the end of this assembly. Algeria on behalf of the group asked that the mandate be clear on the establishment of one or more legally binding instruments and that a clear deadline be set for a diplomatic conference in the next biennium. India, for the Asia and Pacific group, took a more precautionary approach and asked that since further work needs to be done in the IGC, the group would support the renewal of the mandate with a view to finalise the text. But India in its national capacity indicated its wish to have a diplomatic conference in the next biennium. Several countries called for an “acceleration” of the IGC talks toward resolution. Group B of developed countries said it welcomes further work in the IGC and hoped to reach a balanced outcome. A number of developed countries are resisting a binding legal international instrument (or instruments). The European Union said it recognises the importance of the work of the committee and “looks forward to establishing a work programme” but with the understanding that any international instrument be non-binding, flexible and sufficiently clear. There is no agreement on the nature of the instrument, the delegate of Lithuania said on behalf of the group. The United States said the decision on a diplomatic conference is premature and that members must first agree on principles and objectives. A number of countries at the last PBC meeting contested the selection process for new WIPO external offices and have asked for more transparency and a member-driven process (IPW, WIPO, 12 September 2013). GRULAC, which would like to have a WIPO external office in one of its Spanish-speaking member countries, and said it was disappointed by the original list submitted, said it has legitimate expectations to be added in the original five-country list and asked that a working group open to all member states be set up to provide guidance to WIPO on the establishment of future external offices. Group B also supported the setting up of a working group, regretting a lack of consultation on the choice of new external offices. The WIPO secretariat proposal is to put new offices in China, Russia, United States, and two in Africa (countries to be determined by the region). The African Group called for the Assembly to adopt the proposal of two external offices in Africa, stating that Africa is the only continent with no WIPO representation. The Asia and Pacific group expressed concerns about the lack of transparency of the selection process and called for a member-state driven process for the establishment of new external offices. The PBC approved the programme and budget for 2014-2015 subject to conditions including the resolution of the external offices issue. A number of developing countries, such as GRULAC, the Asia Pacific Group, and the African Group are asking that a specific article be included in the draft treaty text concerning technical assistance, which has been resisted by a number of developed countries (IPW, WIPO, 30 May 2013). A number of other countries, such as the group of Central European and Baltic States (CEBS), the group of Eastern European countries, Central Asia and Caucuses, Chile, and the European Union would like the General Assembly to decide on the convening of a diplomatic conference in 2014. The group of least-developed countries (LDCs) also supported a diplomatic conference. Several developing countries, such as the Asia Pacific Group, asked that the global challenges division report to a WIPO committee so that member states can guide the programme, its activities, and benefit from it. The Development Agenda Group urged that the division report to the Committee on Development and Intellectual Property. This was strongly resisted by developed countries at the last PBC meeting. The Standing Committee on Copyright and Related Rights (SCCR) is also working on an additional treaty to protect broadcasting organisations, which was supported by a number of countries. The CEBS group asked that a diplomatic conference be convened in the nearest future. The African Group said it is in favour of an ambitious work programme on libraries and archives. This refers to limitations and exceptions to copyright for libraries and archives, one of the standing agenda at the SCCR. Some developing countries such as the Asia Pacific group also asked that work be pursued on limitations and exceptions for educational, teaching and research institutions and persons with other disabilities. On 24 September, WIPO is organising a forum called “Game-Changing Innovators to Meet Policy Makers,” which has been supported by a number of developed countries and resented by the Development Agenda Group (DAG) and civil society groups. Brazil, on behalf of the DAG, which the delegate described as a group of 19 countries seeking to implement the 45 recommendations of the WIPO Development Agenda, said some groups were given three minutes to present their general statement while WIPO is organising a 2 hour event in the middle of the General Assembly despite a very busy schedule and without any formal decision of the member states. Group B, the EU and the United States welcomed the forum. Foundation (Colombia), Knowledge Ecology International (US), LOCOST (India), the Third World Network and All India Drug Action Network (India) published a letter [pdf] today expressing concerns that the forum will be disrupting the General Assembly proceedings. The US ambassador said they support the opportunity for business leaders to give their views to WIPO membership and that they would like the forum to be an annual event. The packed agenda of the General Assembly also includes discussions on a revised definition of development expenditure, which might change the calculation on how much of WIPO budget is going to development activities. WIPO secretariat said 21 percent of its total budget was devoted to development expenditure. The LDC group in their opening statement remarked positively on this number and said it would enable very significant projects with benefits to LDCs. Also to be discussed is a potential convening of a diplomatic conference to amend the Lisbon System for the International Registration of Appellations of Origin, to include geographical indications. CEBS called for a diplomatic conference in 2015. The African Group and the DAG also asked that the General Assembly discuss a proposal by the African Group, submitted in the PBC on the improvement of WIPO’s governance. A number of countries said the geographical representation in WIPO staff is unbalanced and little has been made to remedy the situation. This will also have to be discussed during the 51st session. A signing of the Marrakesh treaty is expected to be organised this week. Alessandro Marongiu contributed to this report. 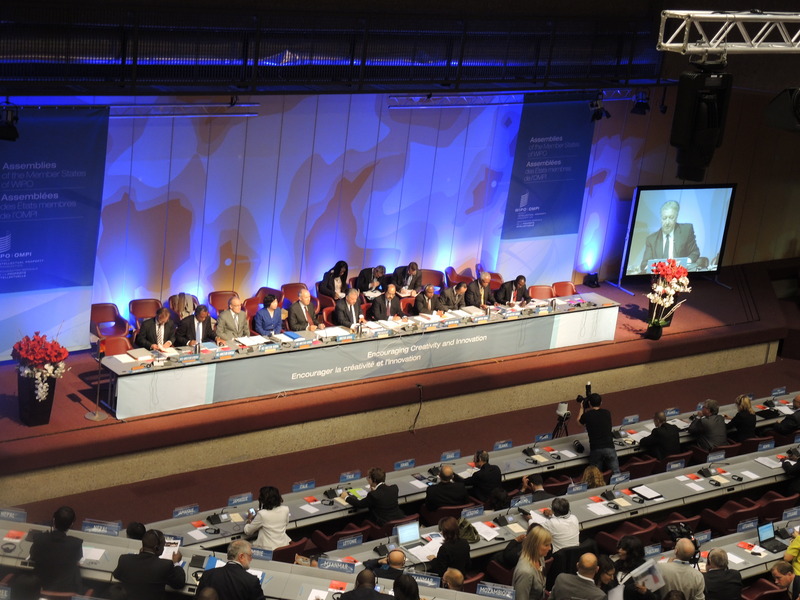 "WIPO General Assembly Opens With Loaded Agenda" by Intellectual Property Watch is licensed under a Creative Commons Attribution-NonCommercial-ShareAlike 4.0 International License.